This superbly written novel details the comings and goings of ordinary people gracefully confronting extraordinary circumstances in the small town of Hesterwine, Texas in 1943. Clara and Justine Hesterwine, whose forebears founded the town, live quiet, predictable lives in a spectacular mansion on the town’s outskirts. Sadly, they face foreclosure of this grand ancestral home, as they are no longer able to sell their famous baked goods, due to the sugar shortage that has resulted from World War II. 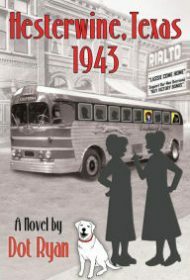 One day, they meet Leeta Bulow, a skinny young black girl, and Mary Kenny, a skinny young white girl, two strangers, each of whom is on the run from tragic pasts and headed to California for a fresh start — until, that is, their funds run out at the Hesterwine bus station. The elderly Hesterwine sisters, at the station, see the fuss and invite the girls to stay with them and their truly loony cousin, Etta Ruth Morley. From then on, the action revs up in Hesterwine with one shocking plot twist after another as the sisters, with the help of Leeta and Mary, try to save the old homestead. Ancient feuds, long-held secrets, sudden deaths, lost loves, new loves, infidelity, the Ku Klux Klan, a violent, racist, sheriff, and a corrupt banker each present new challenges for the Hesterwines, Etta Ruth, and their guests. In its way, the book is a painless history lesson. In 1943, the U.S. was at war in Europe and the Pacific theatre. Sugar and gasoline were rationed. Low flying planes buzzed American coastlines in search of German submarines. Author Dot Ryan gives readers the context of the larger world, even as she focuses on this small town. Ryan manages a large cast of memorable characters with ease. Masterful plotting and expert pacing keep the pages turning. This author surprises readers right down to the last word. Hesterwine, Texas 1943, is immensely enjoyable and deserving of an honored place on bookstore shelves. BlueInk Heads-Up: The Star designation is given with the recognition that copyediting issues (numerous typographical errors) remain in need of attention.